postcard LT-322742 from Lithuania shows a portrait of Frank Eugene (September 19, 1865 – December 16, 1936), an American-born photographer. He had an entire issue of Camera Notes devoted to his art in the summer of 1900 , an honor accorded only a few other photographers. 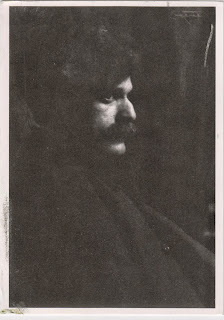 He was appointed Royal Professor of Pictorial Photography by the Royal Academy of the Graphic Arts of Leipzig in 1913. This professorship, created especially for Eugene, is the first chair for pictorial photography in the world. The portrait was taken in 1909 by Alfred Stieglitz (January 1, 1864 – July 13, 1946), another American photographer.